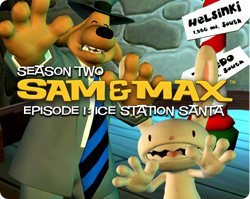 Sam & Max Episode 201: Ice Station Santa is the first game in the second season of Sam & Max episodic content, created by Telltale Games and published by GameTap. 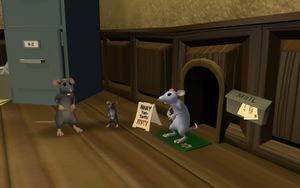 The episode was released on November 8, 2007 on GameTap, with a Windows release the following day. 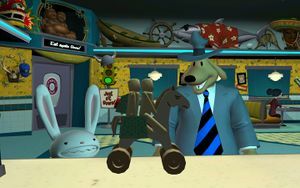 The episode is contained in the Season Two compilation Sam & Max Beyond Time and Space, which was released on May 16, 2008 on Steam, October 14, 2009 on Xbox Live Arcade, and March 9, 2010 on the Wii. 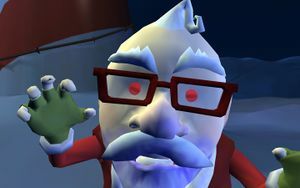 In Ice Station Santa, Sam and Max receive intelligence that something is wrong in the North Pole. Upon investigation, it seems Santa has been possessed and it's up to the detective team to find out how to fix the situation. 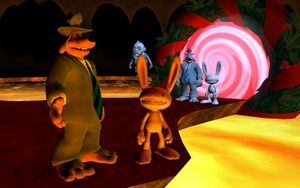 Sam and Max will need to help Santa as well right some wrongs of their own if they want to save Christmas. Stop the crazed robot from destroying the neighborhood. 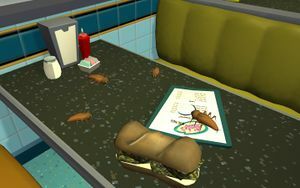 The game starts after a discovery of a potential plot within the office, centering on Mr. Spatula. 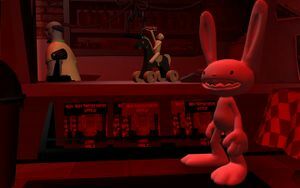 However, before he could be dealt with, he was vaporized by a rampaging Maimtron 9000 intent on destroying Sam & Max. As you quickly discovered, bullets are ineffective against the robot. As such, you need to exit the building to get a better view of the situation and robot. The giant two-story robot has a wind-up located on the back, which needs to be removed. As bullets are ineffective against the robot, and there are no items immediately available for use, your best option is to talk to the robot and figure out why it is attacking. It will state that it's sole purpose is destruction and that it has no free will. While it believes that it can answer any question, it has trouble on "Why do fools make love? ", causing it to turn away from the building for a few moments to ponder the question. This allows Sam to reach the wind-up key from the window to disable the robot, causing it to enter an existential crisis before collapsing. As you return to the robot below, you discover that the robot was a present from Santa. Welcome to the North Pole. Try not to get shot by Santa. At the north pole, you discover the soda poppers wanting to return their presents to Santa - but they aren't going in because of the gunfire. For some reason, Santa has become insane and has opened fire within his workshop. There are two elves taking cover one one side of the workshop, and talking to them indicates that they don't know why Santa turned crazy. However, the green elf has a minor problem of being unable to cry - that is easily fixed by talking to her and telling her that she doesn't exist. (Other speech options may work, but are not yet tested.) Once she cries, you can take the can of elf tears, and water the tiny tree outside. The giant tree provides access to Santa's chimney. You can then retrieve the paper for the exorcism ritual and return to the main workshop area to ask if the apocalypse horsemen were in stock. The manager elf will say that they were all sent out, coincidentally all on the same street where your office is located. The four horsemen were delivered to each of your neighbours - one to the robot, one to Bosco's, one to Stinky's, and one to the Garage. After collecting them, return to the north pole to commence the ritual. It makes a nice hood ornament as well. The horseman of death is located in the Garage, farthest to the right of your street. To obtain the horsemen, you must play a driving minigame to take care of the oversaturation of the Torture Me Elmer dolls littered on the street. Your quota is to hit 30 dolls within 60 seconds. You can replay the game again in order to obtain additional decals for your car - see the Car upgrades section. Find it at a breeding ground for disease. 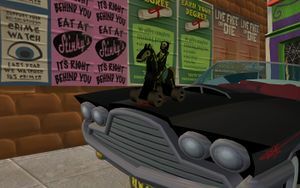 The Horseman of Pestilence is available from Stinky's Diner, and is an award for a trivia contest. The contest is rather simple — the first person to get the correct answer wins. However, as you determine from the first round of trivia, you won't get the correct answer and neither does anyone else within that cafe. You can ask other members of the cafe about the trivia contest. Sybil always gives the correct choice. Some of her responses may indicate whether or not you chose the "correct" answer to the question, but this effect may eventually wear off. Abe Lincoln doesn't know what to answer, and is open to suggestion. Bug always answers D. You can confirm his choice by talking to him - he will agree with you on his selected option, and berate you if it differs. To win the trivia contest, you need to trick the host into crossing out three "incorrect" responses, before choosing the "correct" one. Acquired where there's no longer any food. Bosco received a Christmas present! However, Bosco is torn with indecision to open the package or to throw it away, since he can't decide whether he should be paranoid to believe it's a bomb meant to kill him, or be megalomaniac to believe it's a trillion dollar plunger. However, you can tell from the x-ray posted above the counter that it's one of the horseman. Return to the north pole, and send Bosco a new present. Head to the computer for operating the present dispenser, and order an alarm clock. Pick up the gift tags next to the computer and place one on the package - mailing it to Bosco. When you return to Bosco, he is scared of his new present, and puts it into the bomb disposal unit. While he is distracted, you will open the package and retrieve the third horseman. You will be rewarded for your pugilism. The Horseman of War is a championship trophy for a boxing match, and it's being stored within the robot. It's currently in hands of Jimmy Two-Teeth, the boxing champion - and you are too large to enter the boxing arena. 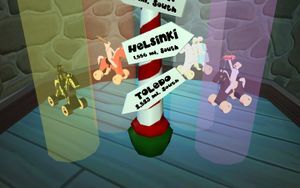 Boxing Betty is located in Santa's Workshop, and can be placed and operated within the arena. There are three opponents, each one following patterns similar to each other. The first opponent is easy to defeat, taking only three hits to go down. Next, the second opponent has four hits and is slightly better on defence. Defence is simple: if the opponent raises his right hand, dodge left. Likewise, dodge right if the opponent raises the left hand. A simple mnemonic is dodging in the direction of the raised glove. When the opponent misses, retaliate with a punch of your own. The final opponent is Jimmy, who's lucky boxing glove can cause a one-hit knockout. Once you beat him, you will get the horseman, but he will climb outside the office window and contemplate jumping to his death. Note:The first boxing opponent seemed vulnerable to chained attacks, but this is not confirmed. Gather the horseman to expel the evil spirit. After getting all horses, return to the north pole and place the horseman around the magnetic north pole. All that's left is to play the music from the record player. 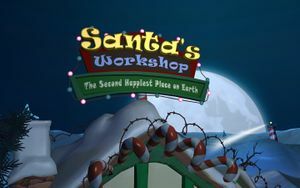 You first need to get the satanic record from Santa's room if you haven't already, but you also need to collect information from the workshop. As you can tell from the crate, there's a gelatinous goo oozing from the top . The origin of the package is from Manitoba. You'll notice some goo in front of the computer - that computer is frozen (typical in this climate) on the highscore screen of Mimesweeper, and has the name Shambling Corporate Presence on the high score list. When you play the record (filling in the lyrics when the record begins to skip), the exorcism ritual begins - the horseman dolls vanish, and the demon is expelled. However, it wasn't Santa that the demon was possessing, it was in the managerial elf. Santa tries to attack the demon, but fails; after telling you to read the back of the ritual, he flees from the workshop with the demon chasing after him. Enter his room, and open the safe on the ground. The three spirits of Christmas inform you that you have ruined Christmas in three different points of time, and need to perform penance for the ruined Christmas. As Christmas was ruined three times, you will need to correct it three times. As you discover in the past, Jimmy has a rough time - in addition to not having profit from the fencing business, he can't find his lucky boxing glove. He needs money to help little Timmy from his Terminal Tourette Syndrome. This requires some juxtaposition - you need to bring the boxing glove to the past, but in order to do so, convince Jimmy not to jump. The sequence begins within beyond the portal to the past. Even though nobody can see or hear you, you can still manipulate objects in the past - for example, turning on the television. Since you know that Mary seemed to have left Jimmy in the past, you might as well do it in a controlled fashion - get the world's simplest maze from Santa's Work shop, placing it in front of the mouse hole, and turning on the television. You can now bring the CENSORED boxing glove back to the past. The bug's family has joined him for lunch. In the "present", you learn what happened when you picked up the Horseman of Pestilence. While pressing the button didn't seem to do anything, it summoned Bug's Family alongside the massive family tensions. He's not able to tell the family to leave, and neither will Sam. As you can determine Bug's stories, he has a problem with flashbacks and a stressful experience with cleaning products killing his father. A snowball from the Yellow Snow Sanitizer will help him. Using the bleached snowball on him will cause him to experience the flashback of his father, report on the nearby cleaning supplies and order the family to move on out. The heat is on to save yourselves. You are stranded in a lava pool, and need to escape. There's no direct means to do so, and no real way to prevent that from what you can tell. However, Santa's sleigh is parked outside the portal, but it is low on coal. Coal is available from the stocking stuffer, but only for dishonest individuals. As you learned earlier, Stinky was quite good at lying up until you won the trivia contest. She has a problem herself - her feet hurt when standing around all day in the diner. You can give her a present from the North Pole - send out the Footbath and Pirhana Aquarium and attach a gift tag to her. Her sock will be found on the counter when you return to the diner. Bring the sock to the north pole, and put it into the stocking stuffer. The sock can then be put into the sleigh, which will be driven into the portal for the future. Take down the demented Santa. You can unleash the three Christmas spirits on the Shambling Corporate Presence - but make sure you have a saved game before doing this, if you want to collect all the decals. After defeating the demon, it's almost time to return - however, Santa eats the left-over Jello, becomes repossessed, and chases you back into the workshop. Santa has you pinned down behind a table - you can't shoot him directly as he's hiding behind a crate. However, you can still use indirect fire, since the cannon can still fire when it's shot. You first need to have a present dropped from the dispenser - this causes the cannon to bounce onto the trampoline. You then need to place the toy bomber in position above the trampoline - since you can't reach the switch from here, you need to shoot it to turn it on and off. The next cannon ball that gets launched will be loaded onto the bomber after it bounces. You now need to drop it into the Flounder Pounder that's behind Santa. Once the cannon ball hits Santa, the ending cinematic commences. Each decal requires you to hit an additional 10 dolls within the time limit. You can also obtain decals for hitting "rare" items, such as the bowling pins and the rolling piece of cheese. When you've collected all the decals, you'll earn an upgrade for your car, which carries through to later episodes in the season. Get each of the following decals to unlock the supercharger for the DeSoto. Torture Me Elmers: You need to hit 40, 50 and 60 Elmers within 60 seconds. These can be easily obtained by going half onto one of the sidewalks and going full speed. Strike! : Knock down all the bowling pins in the middle of the road. Make sure you hit them right in the center. Shred the Cheese: Hit the cheese wheel that rolls down one of the crossroads you cross. Oh, the Humanity! : Shoot the blimp that flies over the city. Look Out Below! : Shoot the piano hanging from the side of a building. Slow down while you're looking for this one. This page was last edited on 28 June 2013, at 19:41.